Nuts to You by Lois Ehlert is a story about a city squirrel who loves to dig to find acorns and nuts. It scampers around flower beds and window pots looking for edible treats, visits bird feeders to steal seed from the birds, and does gymnastics to beg for food. The art work in this book is done in washes of color, variegated shades of grays, brown, copper and greens. To explore colors and hues, give each child a squirrel-shaped piece of paper. Have them glue pieces of tissue paper in grays, browns, and greens, collage style, making sure to overlap the pieces. Draw in facial features with a black marker. Continue your study on squirrels with the activities below. 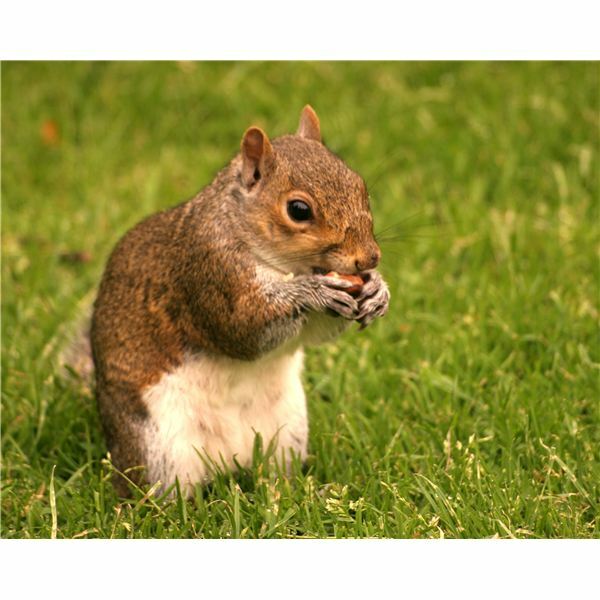 Squirrels collect nuts and seeds to eat. To prepare for winter, they bury the food away from the place where it was found and use their keen sense of smell to find the food at a later date. Snappity, crackity, out it fell! Number an egg carton from 1-12 writing the number with a black marker in the bottom of each cup. Provide nuts (in shells) for children to place inside the cups counting from 1-12. As children advance in their development, they can place one nut in the number one section, two nuts in the number two section and so on. Place children in groups of three spaced around the room. You will need one to three children not placed in a group as the extra squirrels. In each group, two children arch hands (to make a tree) and the third child is the squirrel. To play the game, an adult says, "Change Trees," and all squirrels including the extras run to new trees. Only one squirrel is allowed in each tree. Squirrels not finding a tree wait for the next call to find a tree. During play time, change positions of squirrels and trees so that all children have a turn to be squirrels. For variations, squirrels can hop, walk, or slide to the trees. Sing this song to the tune: "Grand Old Duke of York"
He hides them for the winter months, so he'll have all this needs. And down, down, down he comes. Children will be amazed to see how solid nuts become one of their favorite foods. Invite them to help you put one cup of shelled nuts into the blender. Add 1-2 tablespoons of vegetable oil. Children can push the button and watch the ingredients whirl in the blender until crunchy or smooth. Add a pinch of salt or sugar if you wish. Spread on bread pieces, crackers, or apple slices for a snack. As you partake in these squirrel activities for preschoolers, children will learn about this frisky animal and how it survives in nature, especially during the fall season.